Provo street artist Leuven — whom I first reported on back in April — recently chatted with Gavin Sheehan of City Weekly. Though the beginning of the piece includes some broad generalizations about Provo, it quickly moves on to interesting information about Leuven’s background and objectives. Leuven’s Jimmer piece, on 400 East. Near the beginning of the interview, for example, Leuven reveals the origins of his name — it came from a trip he made to the eponymous Belgian college town — and, later, how he thought up the popular Provo bike image. Leuven’s popular bike image, pasted to a metal box in downtown. But a few especially important points from the interview stand out, at least in the context of this blog. For starters, Leuven seems to spend a lot of time riding through the city on his bike, which is a great way to see what makes a city unique as well as what it lacks. If everyone did this, I suspect we’d have a better city. Leuven: I think when you offer people on the street something to think about, it makes the area so much more interesting. Street art can have an entertainment value. I don’t think it has to be political, but it is a powerful way to make a point. It seems like people pay attention to graffiti more than they do to flyers or advertisements. Gavin: What’s your opinion of our art scene as a whole and the impact it has on our community? Leuven: There is a lot of talent. 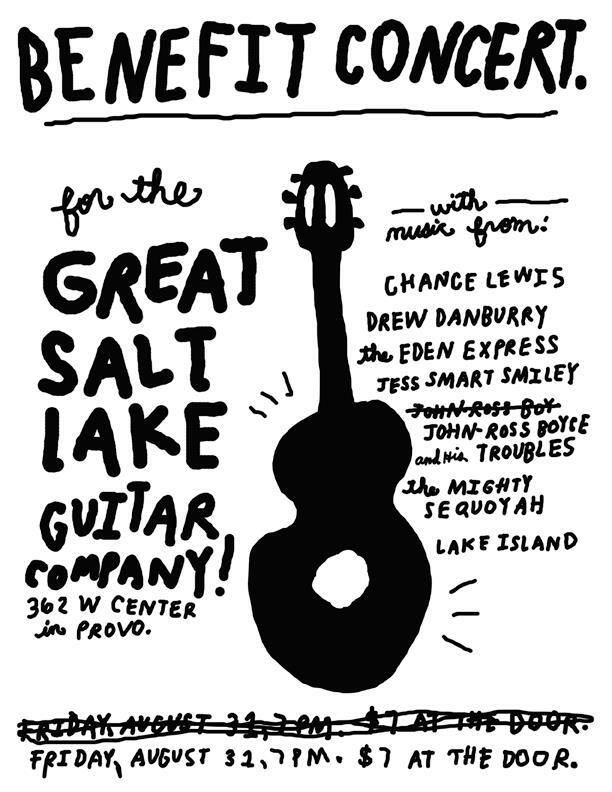 It would be cool if Provo suddenly transformed into this art hub in Utah. I think the city should get more involved in promoting art. It’s an investment, but I think it really pays off. I would love to see Provo get covered with street art. If his artwork didn’t already make it clear, Leuven is clearly someone who is trying to make the community a more interesting, beautiful place. Wednesday, an all-too-common tragedy occurred in LA: an elderly driver slammed into a bunch of people. The event is notable for the extreme age of the driver, 100, and the number of people hit, 11, but in many ways it’s sadly ordinary. These sorts of accidents usually prompt discussion about the rights of elderly drivers verses the safety of people surrounding them. That’s a good discussion to have and some modification of the status quo is certainly in order. But the underlying problem in these cases isn’t that elderly people are driving. Instead, it’s that they often have no choice but to drive. In cities across the U.S., driving remains the primary means of transportation. As a result, people of all ages must drive to get to buy groceries, visit the doctor, or do anything else. Indeed a common argument against tighter restrictions on elderly drivers is that without cars they’d be trapped. That argument presupposes that there’s nothing within walking distance (or wheelchair-ing distance) of their homes and that without a car they’d have no means to access anything. A two-pronged solution could end this problem without putting more cars on the road. First, walkability needs to be improved. Neighborhoods for elderly people actually need to be hyper-walkable, with amenities even closer to homes than in other areas. Sidewalks need to be wider — to accommodate disabled people — and benches and shade need to be abundant. Second, elderly people (like everybody else) need greater access to public transit. They need to be able to access basic amenities on buses and trains, and they need to be able to get to more distant locations, like airports or neighboring cities. The transit needs to be affordable, intuitive, and safe. Provo is in desperate need of these kinds of measures. As Mayor Curtis recently pointed out, the Provo-Orem area was just ranked the best place to age in the U.S. Among other things, that means the area has and will have a significant elderly population. Improving quality of life for that demographic, as well as ensuring everyone’s safety, is desperately needed. Improving walkability and public transit are clear measures to help accomplish that goal. Late last year, developer Greg Soter stepped forward with a plan to turn an abandoned church into downtown apartments. Soter bought the building, researched his options and began moving forward. By now, the building was gutted inside and ready to be rebuilt. The apartments would range from 500 to 1,100 square feet featuring loft bedrooms, high ceilings and laundry facilities. It all sounded wonderful and people from throughout the U.S. were sharing their approval for keeping the building’s historic flavor intact. The city leadership was excited, saying this was exactly the kind of project they were looking for in the downtown area. And then the whole thing was killed by moronic city laws. This old church was going to be turned into apartments until fees made that plan prohibitively expensive. My colleague Genelle Pugmire reported today that Soter’s project has stalled because the city is asking for fees adding up to a small fortune. In July Soter walked into the community development offices to pick up his building permits and to pay the fees. He was handed a bill totaling $130,535.51. For a city trying to add housing to downtown, this situation is absolutely nonsensical. The fees also aggressively discourage historic preservation and adaptive reuse of existing buildings. In other words, official city policy — as opposed to the usual villains of greedy developers or an apathetic populace — overwhelmingly encourages elimination of historic buildings. That needs to change right now. In fairness, Provo leaders are working to resolve the situation. But the solutions mentioned — fee waivers or reductions for Soter — won’t fix the underlying problem and the ordeal could be repeated as soon as someone else wants to save a building. Then again, other developers may never step forward, given Soter’s experience. Provo isn’t the only city that is dealing with this issue. Streetsblog recently reported on the struggle in Detroit to prevent historic buildings from being turned into parking lots. Detroit is making some progress, but the situation offers a useful warning for Provo: make it possible for developers to save great buildings or prepare for developers to give up and replace those buildings with cheap apartment complexes at best, and parking lots at worst. Unless the city and the council can move quickly on a decision, the old 4th ward chapel may remain a vacant shell. 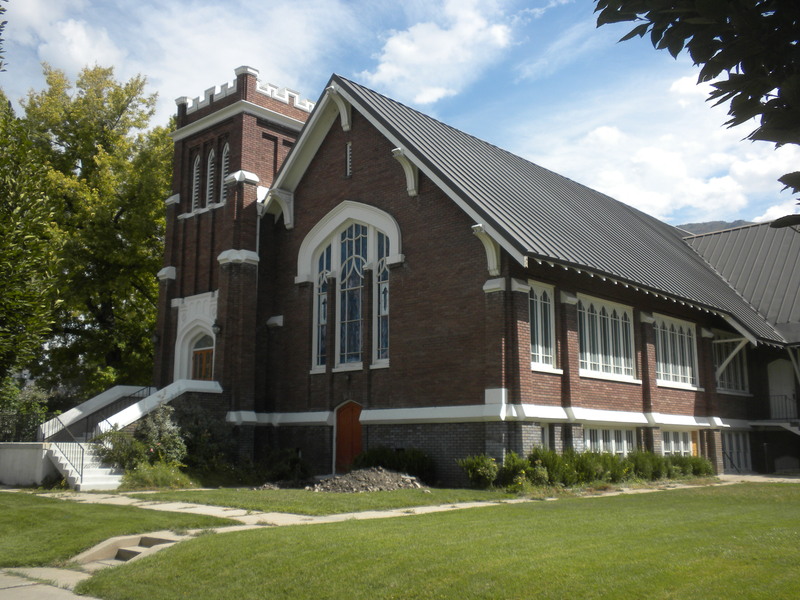 Or, if Soter can’t build his apartments, the chapel could be demolished by some developer looking to put up another apartment complex. In the meantime, Provo city officials are faced with two options. First, change the fee requirements so this project can happen. The changes would need to happen soon because every day the project is stalled Soter essentially loses money and has greater incentives to quit. The changes also should be designed to prevent this kind of fiasco in the future. The second option is to do nothing — or take so long that it doesn’t matter any more. In the long term, that will mean replacing the historic church with something else, like a parking lot, but in the short term it also means nothing can happen with the structure. It will continue to sit abandoned, slowly falling apart until it becomes a pocket of unsalvageable blight. The solution seems obvious, but so far Soter’s project remains stalled. 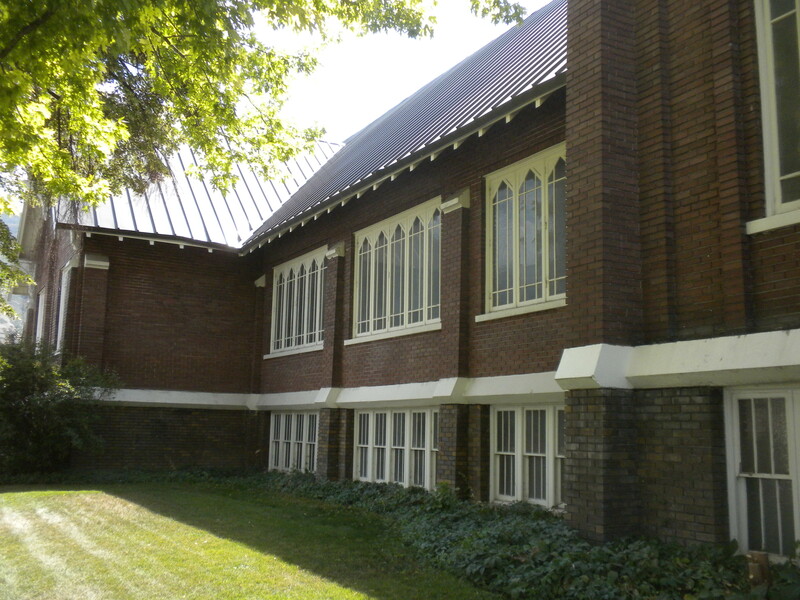 The north side of the church that Greg Soter wanted to turn into apartments. 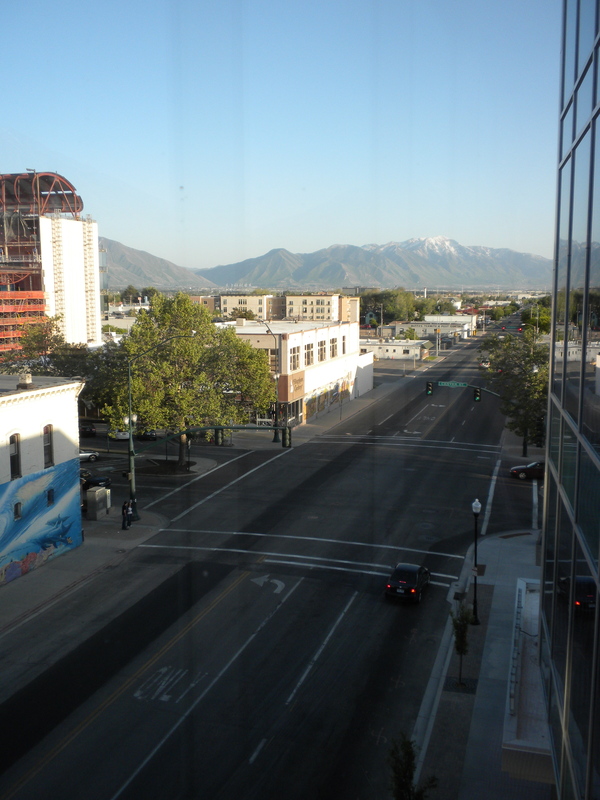 Via @provo_ecdev, I learned yesterday that in 2009 Provo was the 13th best city in the U.S. for walking to work. According to US News and World Report’s Money section, 13 percent of the population was walking to work at that time. Provo was joined on the list of “Top 15 Cities for Commuters” by Portland, Madison, Ann Arbor, Boulder and Cambridge, among other places. The accompanying article adds that ditching the car in favor of other transportation modes can be a way to multitask. The lifestyle might also be especially appealing in a recession. “In difficult times, people really re-evaluate what they do with their time. You can’t be productive when you’re just sitting in your car,” Lashinsky says. For example, biking to work is a way to be active while commuting. Given improvements to public transit and the gradual revitalization of downtown, it’d be reasonable to assume that just as many people — and possibly more — are walking to work today. Thanks, perhaps, to Brigham Young and the turning radius of pioneer-era wagons, Provo has its fair share of daunting, dangerous and extra wide thoroughfares. And while these streets may have been wonderful in the late 1800s, they’ve tended to wind up as stroads today. I’ve written many times on this blog about the superiority of narrow lanes over bloated roadways, but wanting a thing is different than actually getting it. In fact, putting narrow lanes into a western city full of stroads may be one of the hardest things a city might undertake. How, after all, do you fundamentally modify the underlying infrastructure of a region? If you’re San Francisco, you do it one street-stroad at a time. 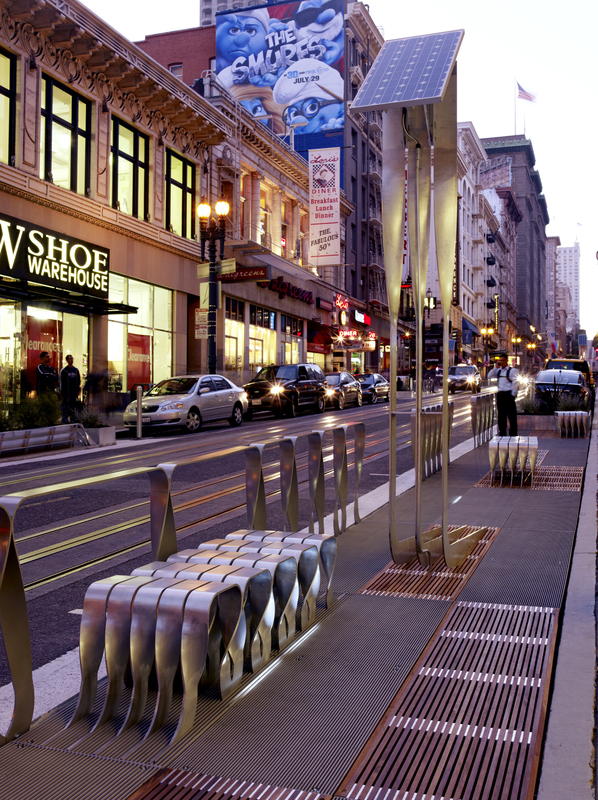 The Powell Street Promenade provides a 6’2” extension of the existing sidewalk, combining material innovation, technology and urban design into a new landscape that offers refuges for pedestrians amid the street’s busy vehicular and historic cable car traffic. It is the largest example of the city’s “Pavement to Parks” program, which seeks to reclaim swathes of urban land for pedestrian amenities. The street now has larger spaces for people and less imposing pavement. It’s a win-win. New benches, barriers, and pedestrian space have replaced parking in San Francisco. Retrofitting an entire city to fix every too-large street is probably not going to happen anywhere. But this example shows how small changes can create interesting new spaces and help a city move in the right direction. And though this particular example may be costly or particularly suited to the Bay Area, there’s no reason Provo couldn’t deploy a similar but localized version. The four-lane Freedom Blvd in downtown Provo. Note the car in the bottom right quarter of this picture. That car’s lane is probably twice as wide as the car itself. There’s also no on-street parking on this street, so that lane’s width is basically useless; it accomplishes nothing besides encouraging speeding and discouraging pedestrian use. If Provo wants to increase foot traffic downtown, pointlessly bloated lanes like this need to be fixed. San Francisco’s new project offers one example of how to do that. Can Neighborhoods Filled With Single Family Homes Be Walkable? My neighborhood in downtown Provo is filled with a mix of single family homes, small apartment complexes, and duplexes like mine. It’s a pretty good mix, but the number of detached houses keeps the density lower than in many more walkable places. Can a neighborhood like mine work in a city that wants to be walkable, sustainable and lively? What about a neighborhood made up primarily of single family homes? 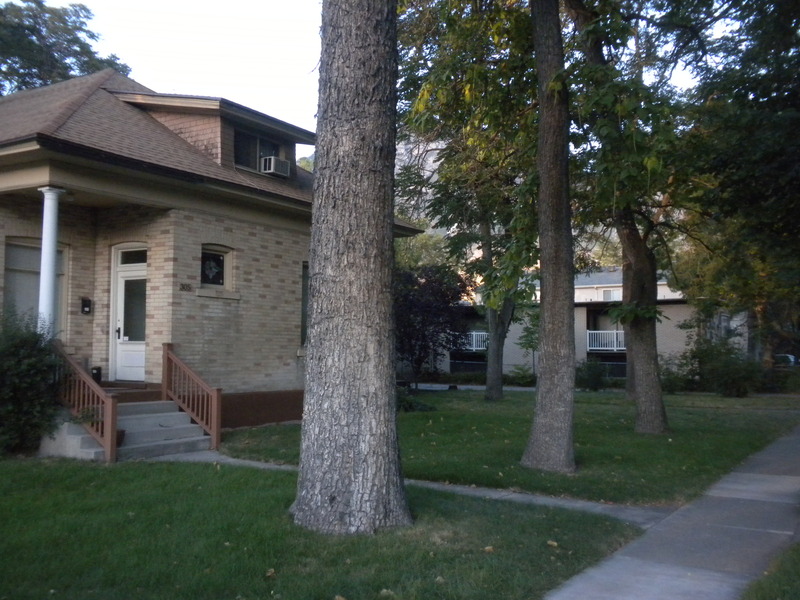 Detached homes and apartments in a Provo neighborhood filled with a variety of dwelling types. Vertical forms cover less ground, leaving more space for nearby schools, parks, shopping areas and other community assets. With more people living in proximity, there is an expanded market for local businesses and a greater overall tax base. Although tax-related benefits are counterbalanced by increased public spending to meet the needs of larger populations, infrastructural efficiencies (that is, doing more with less) may reduce overall costs. With quality management, apartment buildings can also free up time for those who would rather not maintain a private yard. In other words, dense housing can be more economically vibrant and efficient. The post doesn’t get into the environmental benefits, but they’re considerable as well. If I was designing a city from the ground up, I’d consequently add a lot more high density housing than I currently see in Provo. The ultimate point emerging from the Polis post is that density is a good thing, though the ultimate answer to the question about single family housing goes unanswered. Jacobs argued that “between ten and twenty dwellings to the acre yields a kind of semisuburb” and that “as a general rule, I think 100 dwellings per acre will be found to be too low.” She later postulated that between 125 and 200 dwellings per acre is ideal. That’s way beyond what’s possible with detached homes and single family dwellings, so Jacobs was evidently skeptical that neighborhoods filled with those kinds of dwellings could contribute to the kind of vibrant city she valued. I’m also skeptical that such a neighborhood can concentrate enough people to support nearby amenities. There are some scattered examples of it working — particularly in rich, East Coast cities — but they’re few and far between. However, the Polis post is less absolute than Jacobs and instead suggests a possible middle ground: neighborhoods of mixed dwelling types, presumably like those in downtown Provo. 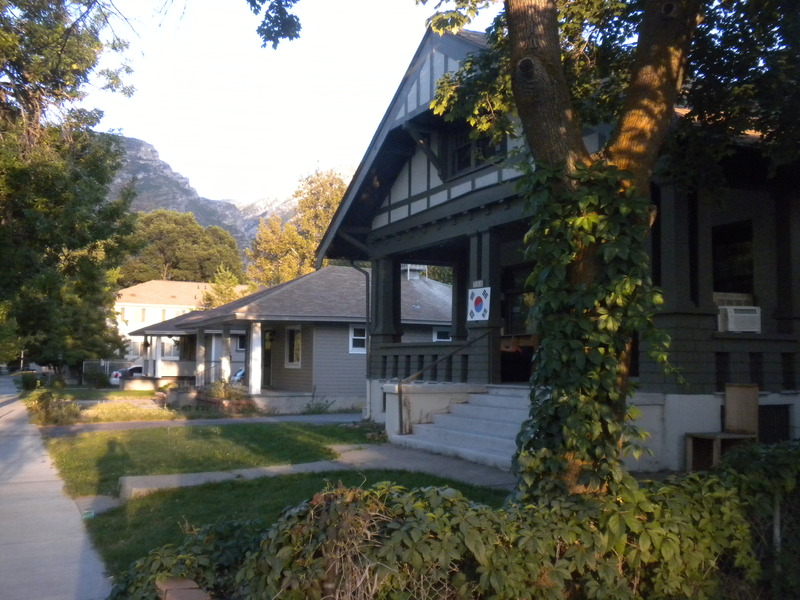 A variety of dwelling types in downtown Provo.